It's on the news everyday - dengue fever in the Philippines is on the rise. In our region alone (CALABARZON), there are already 6,488 cases as of the second week of August 2011. In Pasig, which is the city next to our town, 707 dengue fever cases have been indentified. I know I have protected our home from dengue fever-causing mosquitoes but how sure can I be that my boy is protected when he's not at home. That's when I discovered this DEET-free Guard Insect Repellent. I edit dozens of medical articles a day for a living and that made me more aware of what DEET can do to the body. DEET or diethyltoluamide (N,N-diethyl-meta-toluamide), was developed by the US Army back in the 1950s to protect soldiers assigned in malaria-infested areas. It is a plasticizer and can damage rubber, plastic, and vinyl materials. Overdose of this substance can lead to itching, vomiting, bradychardia, and hypotension. Just imagine what this can do to kids. Picaridin or Icaridin offers the same protection that DEET can provide when it comes to repelling mosquitoes and other insects. In fact, according to the World Health Organization, picaridin is often superior to DEET minus the irritating effects to skin. 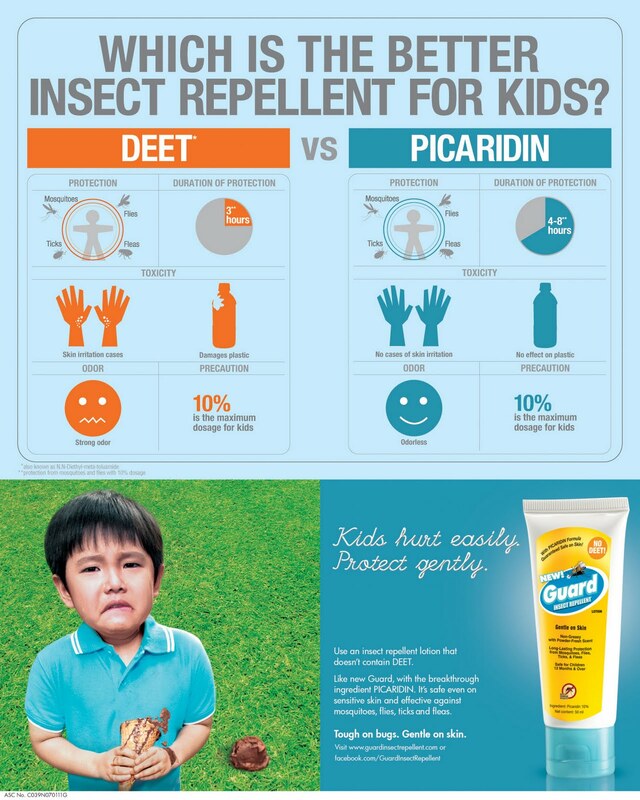 I choose Guard Insect Repellent because it is the only insect repellent in the Philippines with picaridin which is safe for kids ages one year and up. I love its fresh powdery scent and it doesn't leave a sticky feeling on the skin which is best for a tropical country such as ours. Lastly, it is so affordable at only Php 44.50 for a 25ml tube, Php 68.50 for a 50ml tube, and Php 122 for a 100ml tube. They even have a trial sachet sold at onlly Php 6.25! Win Guard Insect Repellent gift packs! Share your anti-dengue fever tip/s to parents by leaving a comment to this post. Kindly include your name, email, and the links to your tweets and FB posts. You can always edit your comment to add any additional links should you post/tweet more than once. "I, @Guard Insect Repellent, and @The 24-Hour Mommy say NO to dengue fever!" Please be reminded to set your privacy setting to PUBLIC. Only 1 entry a day per reader. Tweet about this give-away by clicking the Tweet This button at the beginning of this entry and adding @mauieflores at the end of your tweet. Only 1 entry a day per reader. This give-away is open to Philippine-based readers only as I will be shipping the Guard Insect Repellent gift packs. I will only be accepting entries until September 15, 2011 12 noon. The name of the winner will be posted in The 24-Hour Mommy Facebook page. Guard Insect Repellent is available in Puregold Price Club, Robinson's Supermarkets, Rustan's Supermarkets, Shopwise, Waltermart, and leading drug stores nationwide. It is a product of Consumer Care Products, Incorporated. You can visit http://www.guardinsectrepellent.com for more information about the product. My 3 kids got struck with dengue fever last 2009.all my 3 kids! i never want it to happen to my kids again! all the dextrose, needles stuff i can't stand! i'm a medtech myself and yet i suffer whenever i see my kids undergo that kind of pain! but that incident taught me to be more protective of them. i learned that citronella plants are mosquito repellent inside the house. cleanliness really is next to godliness. prevention is really the best. i also learned that there are mosquito pellets which we can put also inside the house. for just a little amount , can save lives. Erica Yu-B// http://www.facebook.com/profile.php?id=1408605907#!/profile.php?id=1408605907 retweeted, posted on fb :) thanks!! -I apply anti-mosquito lotion to my boys. -I make them wear light colored clothes. To protect your kids from dengue u must applied GUARD INSECT REPELLENT and your child will always protected from insect bites that can cause fever/dengue. Always use insect repellent when traveling, if not use those anti-mosquito patches. They really work! 1. Use mosquito repellent that is safe and hypoallergenic in your child's skin.2. Use mosquito nets while sleepingif you do not already have them, install mosquito meshes on windows3.Air conditioning also helps keeps mosquitoes away.4. Let your child wear clothes that will not exposed their skin like long sleeved and pajamas.5. Always make sure that environment is clean and free from stagnant water. I always apply insect repellent lotion or spray to my son's skin after bathing to make sure that he'll be safe & protected and won't be bothered by mosquitoes even during and after playtime. Guard insect repellent really guards my son against dengue-carrying mosquitoes. * Wear protective clothing like long pants and long-sleeved shirts. * Close the windows at dawn and dusk (active mosquito times) to prevent mosquitoes from entering your house. * Apply insect repellent on your exposed skin to prevent mosquito bites. * Take prompt medical advice once fever starts. For mummies with babies aged newborn to 3 month, keep them inside mosquito covered nets even during daytime. By age 3 to 6 months old, a generous slathering of citronella in virgin coconut oil works wonders. I've done that to my daughter because she could not stay put in her mosquito repellent net and she did not have any allergic reaction towards it. When my daughter learned to walk by 7 months, I could not put on citronella every 3 hours so I used Guard (Icaridin) instead which I apply every 6 hours. It not only repels mosquitoes - even fleas, flies and other bugs hate it. Since my son has asthma and it is said that it is Dengue is more fatal to them, I am very cautious and on-guard 24/7. During school time, I let him wear long pants and apply Guard Insect Repellent lotion. After school, he wears his pajamas and changes his shirt once he sweats because it is said that mosquitoes are very much attracted to the smell of sweat. Every 4 hours, I re-apply the lotion all over his body. He never goes out without protection. Cleaning our house and room everyday is also a must. 1 hour before sleep time, I spray mosquito insecticide just to make sure that there are no mosquito roaming around the area. It had been on the news always regarding the continuous spread of dengue. As a mother I am of course would like my son to be protected from this dangerous mosquito bites. Therefore I make sure there are no stagnant water within our home's vicinity that might be breeding ground for mosquitoes; I always let him wear pajamas and long sleeve shirt especially when we are going out; the screen doors and windows I make sure are always lock; I gave him daily vitamin supplements at least for health protection. keep your children fit and healthy. keep them clean and always put insect repellent lotion. keep your surrounding clean and informed them to always take care of themselves. I always make sure that i have insect repellant lotion. I am so afraid that my kids will suffer again the dengue fever especially now, it's rainy season. I always check our backyard and make sure there will be no stagnant waters to avoid mosquitos breed. And spray mosquito insecticide in every room. Thanks for joining, Erica. May I have the URL to your tweet because it doesn't appear in my timeline. -Use mosquito repellents.-Discard all unwanted items getting gathered around the living area to avoid the breeding of mosquitoes.-Keep the water stores clean and closed.-keep yourself well covered when outside.-Take prompt medical advice once fever starts. Hi, Stacy. Kindly click the FB share button at the beginning of the post to also share this blog entry in your FB wall. Thanks! Hi, Elinor. Please add an anti-dengue tip so I can validate your entry. Thanks! As a working Mom and a Nurse too, I always make it a point to protect my kids. Even in the time of non-dengue fever craze I make sure that they are mosquito bite free all the time specially when they head to school everyday. Mild and hypoallergenic anti mosquito repellent always work. At home, I always remind people at home to check on stagnant water in the garden and in the laundry area, this eliminates the spread of egg laying mosquito. I also do mosquito spray in the afternoon before the kids arrive from school, the water based type mosquito spray. When my daughter is in school I see to it that she has a mosquito repellant in her skin and I also buy a sleeve net and I'll put that on to her arms to avoid mosquito's bite.I also put a knee socks to her so that even if I'm not with her at school I'm sure that she's safe from dengue. 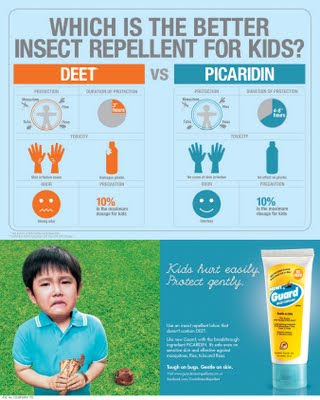 EMAIL: zettegayao@yahoo.comalways use lotion especially GUARD INSECT REPELLENT cause DEET is better than PICADIRIN. I see to it that everyday I scrub flower vases and change the water inside them. I wash the roots of flowers and plants thoroughly as mosquito eggs can stick to them easily. 1. First, I use mosquito repellents. 2. Discard all unwanted items getting gathered around the living area to avoid the breeding of mosquitoes. 3. Keep the water stores clean and closed. 4. Keep yourself well covered when outside. 5. Take prompt medical advice once fever starts. It seems that your FB post is not set to public so it doesn't appear in our FB page. You only have 1 extra point so far. Hi, Nina. Your post and tweet are not set to public. I can't validate them. Hi, Suzette. I can't validate your tweet because it's set to private and I can't see it in my timeline. You have 1 entry so far. ALways wear Long sleeved Shirt, pants and Put Lotion insect repellent. Clean your sorroundings. Always use GUARD INSECT REPELLENT to keep off those dengue carrying insects 24/7. Never go on a get away without an anti mosquito lotion. You'd find that it's not easy to look for one when you're already in an island or climbing a mountain. using Guard insect repelllent lotion is good. But dont forget to clean your sorroundings is the most important too. Using guard insect repellent is good and don't forget to clean your surroundings is the best thing to do. Sorry, I can't validate your FB post and tweet because both are set in private. Always wear long sleeves and pants and avoid wearing dark colors such as black it can attract mosquitoes. Always put insect repellant lotion and avoid going to places where mosquitoes lay their eggs. Above all always sure to clean your surroundings. I have two active kids who loves to play outside, thats why i always clean around inside and outside of the house. I always have insect repellent for them, i apply it before they go out to play. Let us always abide on the cleanliness rules,,,as a saying goes- cleanliness is next to Godliness. We are now over populated here in the Philippines but a disciplined nation can beat dengue. Keep the surroundings clean and always put insect repellant. Give them healthy snacks or food so they have enough energy and dont allow them to play outside everyday especially if the place is dirty and have mosquitos. I place Citronella plant around the garden. and I always dress my baby with pajama. mommies like me are very aware in mosquito that may cause dengue...and we always want to protect our baby's and children's in this case. a simple tip for a caring mom like me is to clean our surroundings specially the place where our kids are always there.apply a insect repellent assurance of our kids cleanliness is also important. I always make sure that our house & surroundings are clean and free from stagnant water where mosquitoes could breed. I also spray insecticide around every week. I also protect my childrens skin by applying insect repellants when they go out and play and also at school. apply anti mosquito and always keep your house and things clean and eat a lot of fruits and vegetables. * safety tips: Use Guard insect repellents. * discard all unwanted items to avoid the breeding of mosquitoes. * Keep the water bins clean and closed. i always dressed my todd pajamas and i placed a citronella plant on the garden. We all know that dengue carrying mosquitoes strike in the afternoon onwards, all-year round.That's why just like what I do, please let your child/children wear pajamas even in the afternoon. And if necessary, also let them wear long sleeved clothes, but if it's not possible, lather a small amount of insect repellents on thier skin (if the repellents can be used topically). Let's feed our children with fruits and vegetables reach in iron so their body can produce enough red blood cells to fight off dengue. Vitamin C should especially be in the list when taking care of our children. Let's also give them fruits and vegetables rich with this vitamin everyday. My dengue tip for parents? Keep your home clean and insect free. Apply insect repellent on your kids to keep mosquitoes away. Monitor your child's wellness. Nothing should be left to chance. Liked The 24-Hour Mommy in FB & Guard Insect Repellent. Random.org results are now posted in the Facebook fan page. Thanks to everyone for joining!